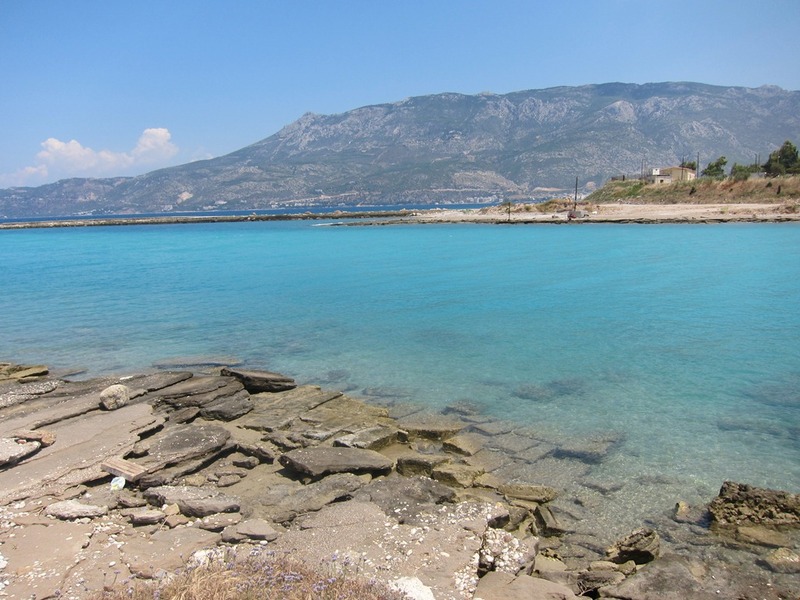 Anyone who has stopped at the submersible bridge at Poseidonia near the Corinthian Gulf will be familiar with the sign and road shown below. 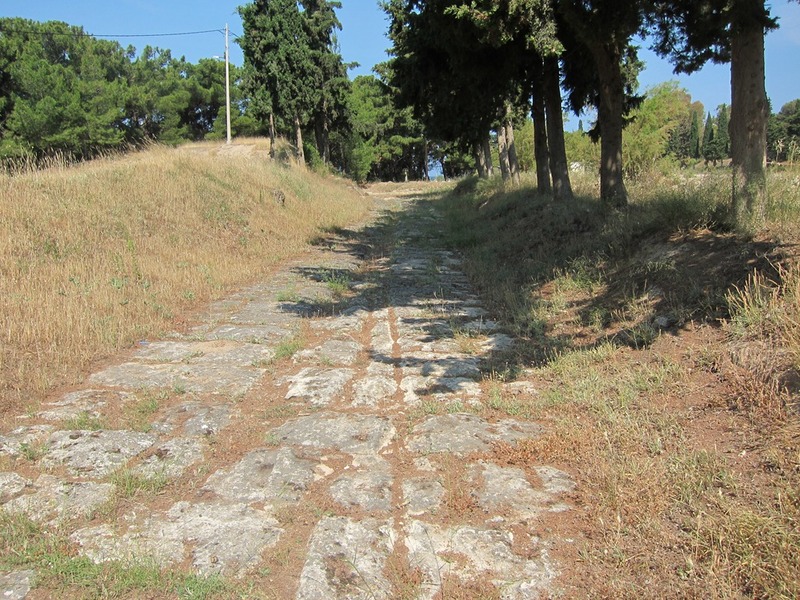 This is Sector G and represents only a short segment of the road excavated by N. Verdelis in the 1950s. The following figure shows the sectors of the road that Walter Werner (1997) came up with to discuss the monument. 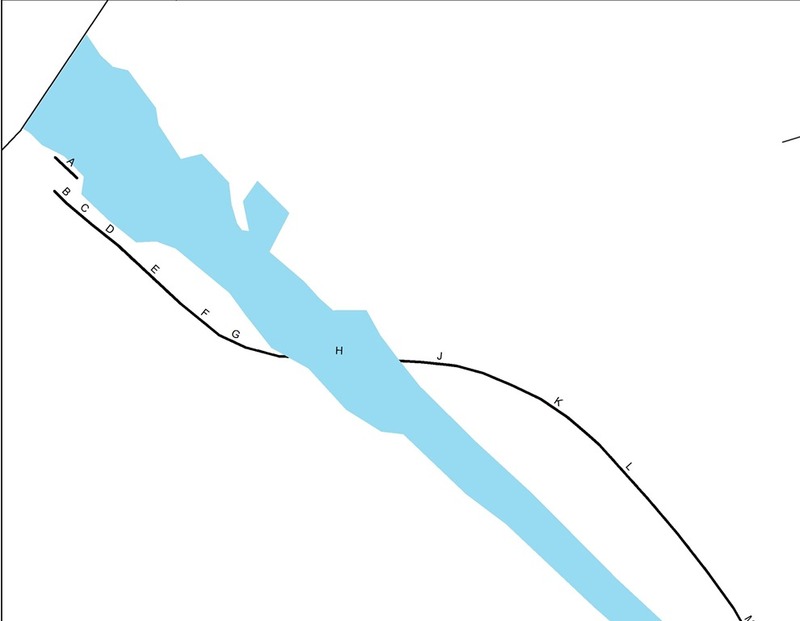 Everything on the eastern side of the canal (in blue) is enclosed in the Greek Military Engineering school, and you have to request permission ahead of time to access it. 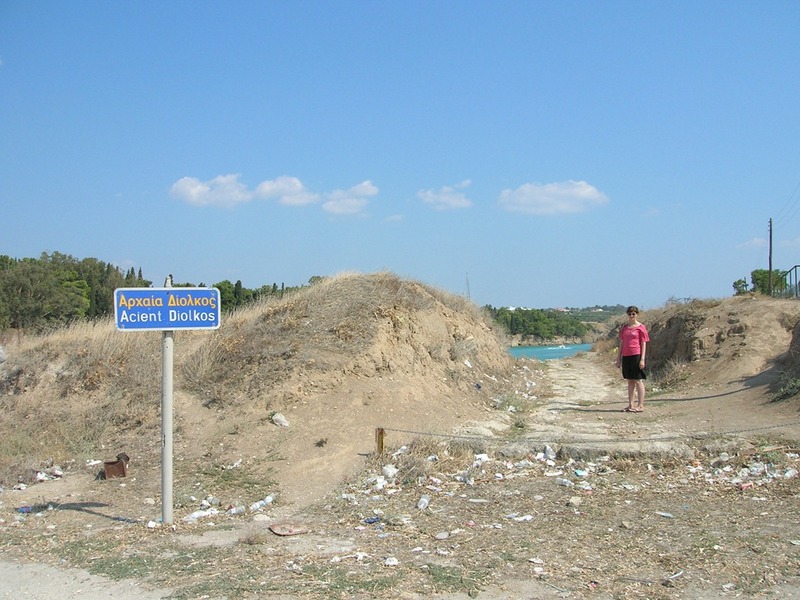 But all the Sectors (A-G) on the western Peloponnesian side of the canal are easily accessible. 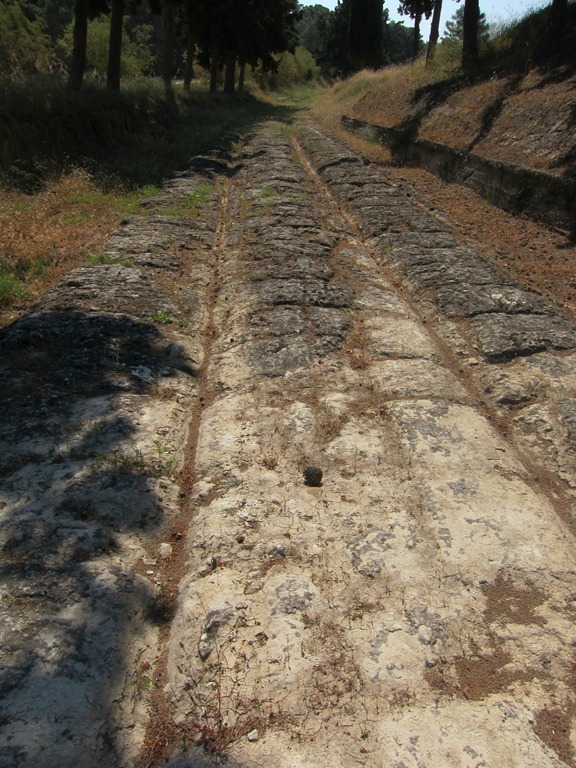 Sector A, shown in the two photos below, is the platform along the modern canal, which Fowler long ago (1932) thought was the beginning of the road, but which the road’s excavator, Verdelis, demonstrated was disconnected from the road by a span of about 10 meters (see plan above). Note the thick layers of sandy / pebbly sheets that have capped the pavement. 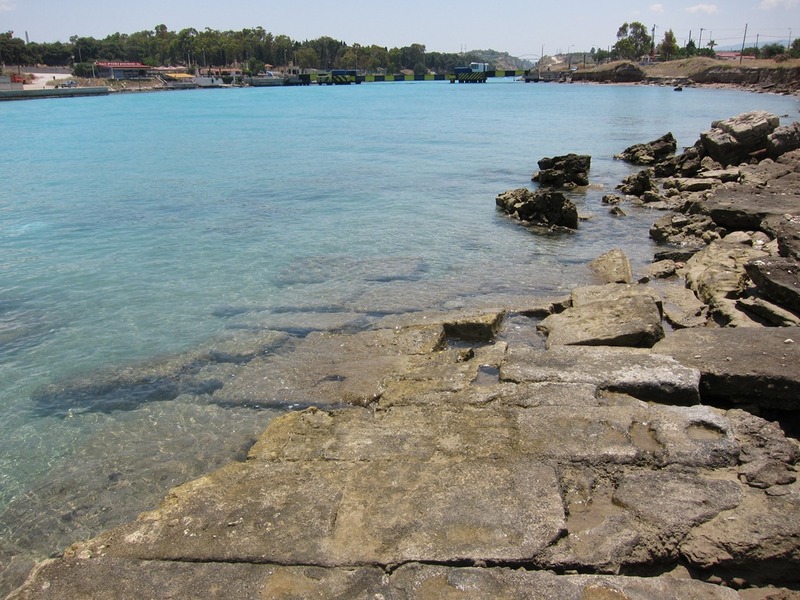 Sector A has been reasonably interpreted as an ancient landing platform or quay that presumably relates to the diolkos. 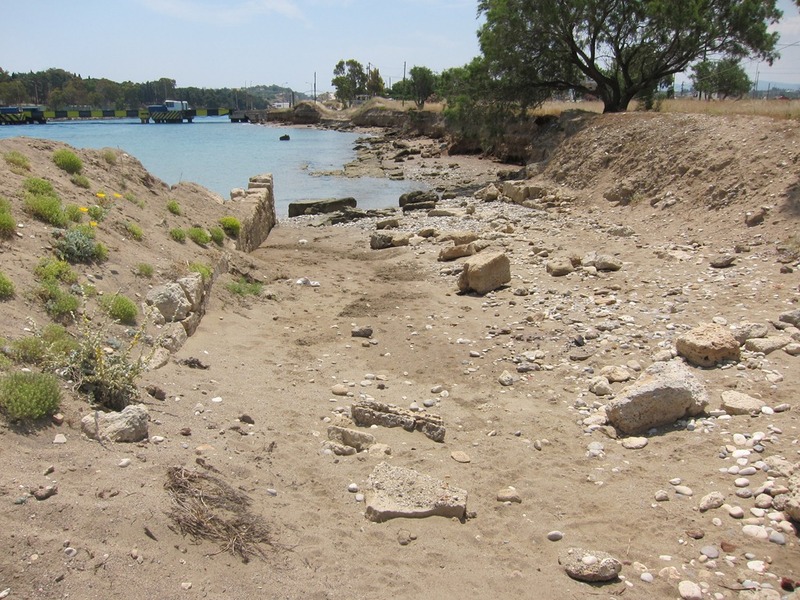 Sector B is visible in the following photo as the sand-covered area to the right of the low wall on the left. Sector B marks the true terminus of the road on the Corinthian Gulf. 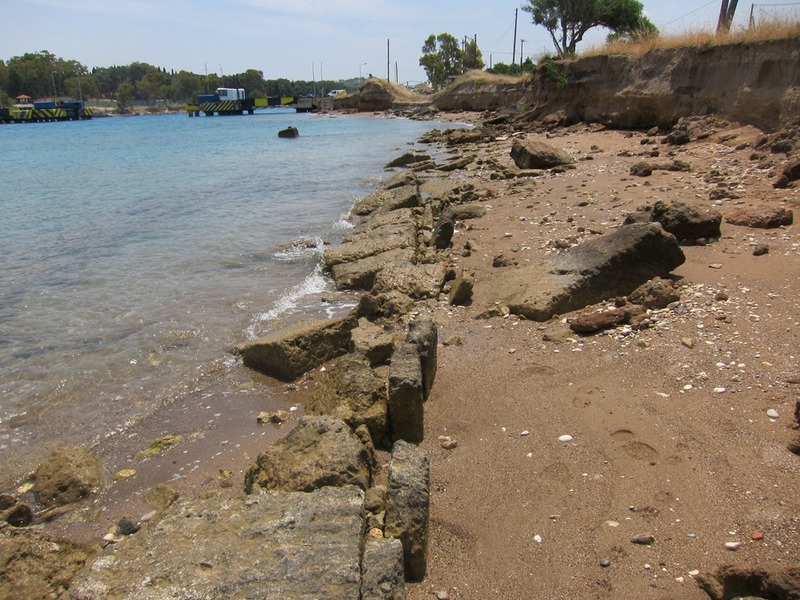 The pavements are now covered over by layers of sand but the western, southern, and northern walls are still visible. Sectors C and D have survived poorly because of continual exposure to the waves of ships passing through the canal. They are now mostly underwater. Sector E is one of the best preserved sections of the road but has eroded significantly over the last half century. Still, it is accessible to the modern visitor who walks northwest from the modern coastal road. A walking video tour of Sectors E-G. 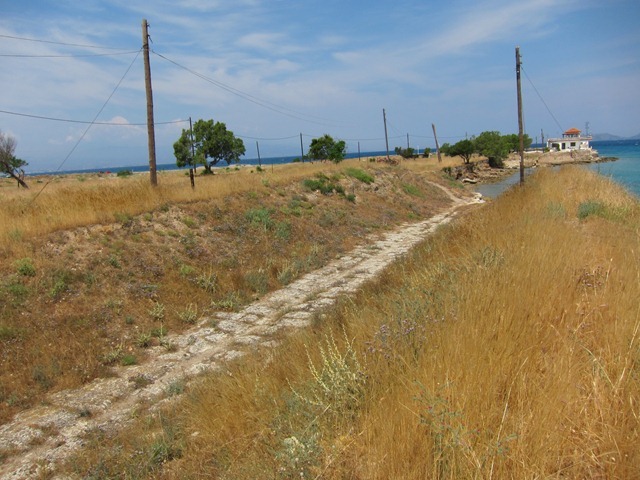 The video starts out facing Sectors B-D.
A walking tour of Sector G.
Sector K is the part of the diolkos road on the Ionian side of the canal. To visit this sector, one must apply ahead of time to the Greek Military Engineers School for permission. The images shown below are from early June 2011. The deep cut grooves visible in the surface of the road may indicate the use for transporting heavy loads over the Isthmus. One can see slight curvature in Sector K in the distance.